On the screenshot attached, calculator has focus, we see text overlapping in Nautilus 3.26.0. 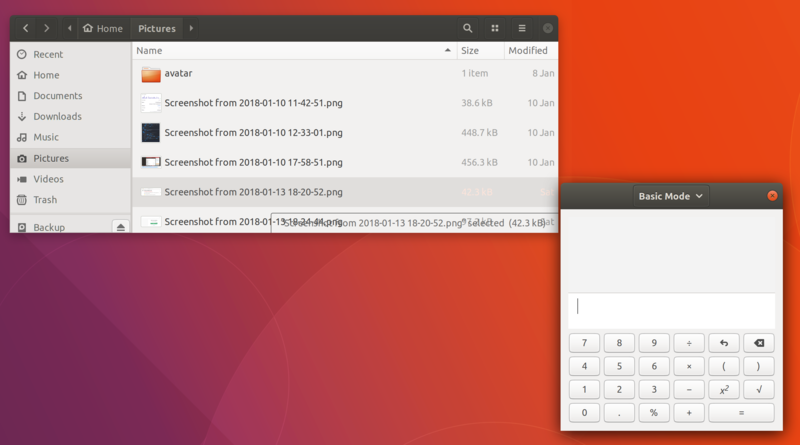 This bug was originally reported in https://gitlab.gnome.org/GNOME/nautilus/issues/211, but we assume it's Ubuntu theme fault. I think I saw this was fixed in 18.04. Can anyone else verify? Yes, now fixed in 18.04. I can still reproduce this bug. You have to switch between windows to see it. See the attached screencast. Yes, window must be out of focus to reproduce. > see it. See the attached screencast. > ** Attachment added: "Nautilus-Theme-Bug.ogv"
> overlapping in Nautilus 3.26.0.